We are delighted to announce the growth of our dental division with the appointment of Andrew Tasker as Dental Area Manager for Northern England, Scotland and Wales. 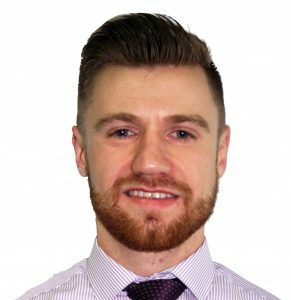 In our latest blog, Andrew tells us about developing his knowledge of dentistry at DP Medical and what his family think of his new role. “I actually studied to become a secondary school teacher at University, before rethinking my career options and getting a role with PepsiCo, first in supply chain and then in sales. “However, I had always been really keen to move into a more clinical based sales role but only for the right company. I’d been approached by other organisations before but when the opportunity with DP Medical came up I just knew it was for me, especially as they are such a well thought of and established company. rt the company at dental schools, exhibitions and trade shows. I’m already really enjoying the role and love meeting new people and clients regularly. I’m excited about getting out seeing the dentists I will be working with and developing my knowledge of dentistry. “One of the best aspects so far has been actually going to see how our famous dental microscopes are made at the Global Surgical Corporation’s headquarters in St Louis, Missouri. You really get to appreciate the effort and attention that goes into each one, and I met some great people from all around the world. That has definitely been the highlight so far! “My wife, Rachel, and children, Noah, Max and Hallie, are all really proud that I’m working in such an innovative industry and helping dentists to do their job! I think they can already see that I’m really enjoying my working life here. 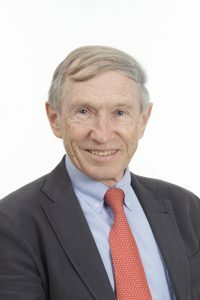 In our latest guest blog, Honorary Consultant Plastic Surgeon, Brian Sommerlad from Great Ormond Street Hospital for Children, talks about his relationship with the renowned charity CLEFT and explains more about his pioneering work in Bangladesh, which DP Medical has recently supported. “As a plastic surgeon at Great Ormond St Hospital for Children (GOS), my main clinical activity has been the care of children (and adults) with cleft lip and palate. “I am also the chairman of CLEFT, after founding the charity in 2007, which funds research into cleft lip and palate and supports cleft teams in several low-resource countries. I have been involved in supervising some of the research which CLEFT funds and supporting cleft teams in Sri Lanka, Uganda and Egypt in addition to Bangladesh. “Our major initiative at the moment is a project to develop, with Bangladeshi colleagues, a comprehensive cleft centre in the Sheikh Hasina National Institute of Burns and Plastic Surgery associated with Dhaka Medical College Hospital. “In my 18 years’ experience of regular visits to Bangladesh to assist and teach, I have become aware of the shortcomings of many initiatives. None provide all the ongoing care needed for children with cleft lip and palate, including speech therapy, orthodontics and further surgery which is usually required. This is the basis of the centre which we are establishing and we are also looking at setting up similar centres in Sylhet and Chittagong. “I am about to embark on another trip to Bangladesh and I will be there for almost three weeks. Colleagues from the GOS cleft team are joining me for the last week. “DP Medical has supported us on this latest trip by providing an endoscope at a reduced price which will enable the team (especially the speech and language therapist funded by CLEFT) to investigate the palate function of patients whose speech is unsatisfactory. With a C-arm which we provided previously for X-rays, it will provide the equipment needed in the centre in Dhaka for palate investigations in the long-term. In our latest blog, DP Medical’s commercial director Owen Pemberton, looks back at a successful BDIA Dental Showcase. “The BDIA Dental Showcase, this year held at the NEC in Birmingham, is one of the highlights of our events calendar and this year proved to be no different. In fact, we are delighted to report that it was our best ever as we made a record number of sales. aging lecture sessions and top up their CPD in the process. “It’s a fantastic event to be part of and one that we entered into this time with a shift in focus as we recently made the decision to no longer provide loupes as part of our product range. Instead we are concentrating on the very latest in dental microscope technology. “As our founder, Doug Pitman, highlighted earlier this year it had become increasingly clear that the need for advanced systems such as Global microscopes is now superseding the more basic forms of magnification. The advancement of microscopes with their enhanced design, affordability, first class quality and the service and support available, has been widely accepted by dental leaders both here in the UK and internationally. “The BDIA Showcase was the first real test of this change in direction for us as we went purely to demonstrate our A-series Global microscope range and it was very pleasing to get some really positive feedback combined with strong sales. It was incredibly reassuring for us to do so well as it reaffirmed our decision to provide our customers with microscopes which is where we believe the future of advanced dentistry magnification now lies. And the demand for the products is obviously there. For further information about DP Medical or the A-series Global microscope range please email sales@dpmedicalsys.com or click here. The cutting edge technology we supply means we need the best technical support to go along with it. That is why we are delighted to announce the appointment of Mark Grant as our new southern service engineer. In our latest blog, Mark tells us about his life-long interest in technology and how happy he is to be putting this to good use in the DP Medical family. “My previous role was with NCR Ltd where I worked as an electro mechanical technician for 17 years. My job involved fixing ATM machines, EPOS systems and self scanning devices such as the self-service tills in supermarkets that people use every day. “My role of southern engineer here at DP Medical is quite varied. I can do everything from the installation of medical hardware and commissioning, to arranging and carrying out servicing for existing customers’ hardware. On top of all of this I spend my days responding to breakdowns. I cover the entire south of England so a large part of my role is driving, however the satisfaction of successfully carrying out a repair is a great feeling and it really does make it all worth it. “That is what I like best about my role – having the ability to fix what’s broken. It gives me great pleasure to be able to see a problem and solve it. I have always been very inquisitive and interested in learning about electronics and how things work. This new role is ideal for me in that sense as it allows me to b roaden my knowledge of new technology and the cutting-edge equipment supplied by this company. I found meeting customers very daunting at the start and it was tricky finding exactly where I needed to go to provide support. I’m definitely getting there though and since my appointment I’ve found it’s never too hard to find a hospital! “I like DP Medical as it really has a family type of atmosphere, which is often lost in bigger companies. You feel part of the team here and know you can always get the help you need if you’re stuck or turn to somebody and ask questions. “I have manufacturer training coming up soon and it is always great to learn from the people that make the equipment. You can really get hands on there and ask all the questions you have. It’s especially important to get answers to even the most technical ones. Frances leads the way with fundraising drive! We are so proud of our DP Medical colleague and friend Frances Bridgewater who recently donned her walking shoes in aid of a fantastic cancer charity. 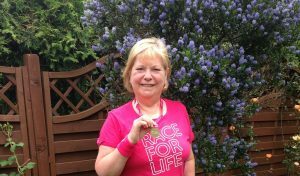 Here, in our latest blog, Frances, talks about her Race for Life and how much she enjoyed the experience. “As soon as it was mentioned to me and my colleagues that DP Medical was looking to do some fundraising as part of the organisation’s 30th anniversary celebrations, I knew I wanted to help. “The next step was to find something that I thought I could realistically achieve! I was keen to do something for a cancer charity as it is a cause very close to my family’s heart and when I saw that Cancer Research UK was holding a 10k Race for Life in Stamford, near where I live, it was the perfect opportunity. “I have to admit that I am not a runner so, as a very keen walker, I knew from the outset that I would aim to walk the course in as quick a time as I possibly could. “It was an absolutely glorious setting and the atmosphere was incredible. Over 1,000 women joined together to take part and it was a wonderful experience just to be involved in the occasion. There was a huge amount of support around the course and you really felt everyone had come together to achieve their own personal goals, whatever they may have been. “I kept an eye on how fast I completed the first kilometre and aimed to maintain that speed for the full race. I ended up finishing in 1hr 40 minutes which I was really pleased with. But the icing on the cake was to have raised £265 which goes directly to the charity to help in the fight against cancer which is such a terrible disease. Customer service is at the heart of everything we do here at DP Medical and having the right staff who share these values is vital. That’s why we’re delighted to announce the appointment of Louise Wild as an area manger to our growing team. 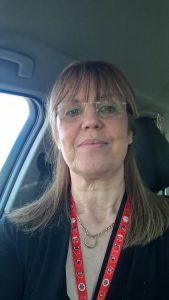 In our latest blog, Louise talks about her background in medical sales and why good customer service is integral to how she operates. Louise said: “I’ve had a varied background which started off with me running pubs for 15 years! After that I decided on a career change and became a business manager at a pressure washer company mainly working with the MoD and NHS. I began to take more of an interest in the medical side of the job and eventually moved just into medical sales. Following that I spent eight years with Olympus as an ENT sales specialist which is where I really honed my craft. “I love the NHS and because I’ve been involved with it for a number of years now I know how the system works. Initially it’s hard to get your head around it all because it such a complex and vast organisation but with experience you learn how to navigate it and off you go! “I’ve only been in post as DP Medical’s area manager for south central and south west for a couple of months but it feels like I’ve always been here. I’m enjoying running my area with some autonomy and doing it my way which suits my style. I like the travel and the hands-on training I received was second to none. It meant I was able to really understand how all the kit works right from the early days and not spend weeks in a classroom so I could get out on the road quicker and meet our lovely customers. 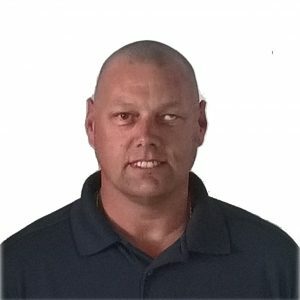 “I moved to DP Medical because I wanted to work for a smaller company again where you are not just a number and the way of working is smarter and more streamlined. It’s great to be able to have a more personable approach as I found with the larger companies it could become quite robotic. Admittedly there is nowhere to hide if things don’t go well but the advantages definitely outweigh that! Steven rises through the ranks! Here at DP Medical we are always extremely proud of our staff who often go above and beyond to ensure they are delivering the best possible service to our customers. But for one team member in particular, their efforts have not gone unnoticed. 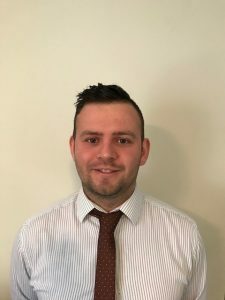 After starting at the company over nine years ago, Steve Connors initially worked in the warehouse but has risen through the ranks to become our new south east area manager. In our latest blog, Steven gives us an insight into how his hard work and dedication to the job has been rew arded. Steven said: “I was initially a member of the warehouse team where I helped with the receipt and dispatch of the equipment, checking the products were all ok and collating them ready for orders. I did this for about four years before moving on servicing side where I would be out and about installing, servicing and repairing our products. I really enjoyed the customer facing side of that role and it has served me well with regards to my new position where I am meeting some of the same people but just in a different capacity. “I really love working for DP Medical so am delighted to have been promoted to an area manager in the medical division. I feel I’ve come a long way over the years and to have that hard work and loyalty recognised is really satisfying and says a lot about the company ethos. “It’s been an exciting few weeks for me as I’ve got used to my new job. I really like the travelling and meeting new people. I much prefer being out on the road rather than stuck in an office because I enjoy the differing environments you find yourself in and that every day is not the same. “DP Medical is a special company because each member of staff is viewed as a person not just a number so you don’t get lost in the crowd like you can do at a large corporation. In fact, one of the best things about my new role has been my manager Rob who has been incredibly supportive as I’ve adjusted to my new working life. To know there is always someone there you can ask a question to or if you need a bit of advice or help has made the process so much easier. We’re thrilled to announce Mr Yakubu Karagama, an esteemed consultant otolatngologist from Central Manchester University Hospitals NHS Foundation Trust has joined the faculty for our upcoming Trans Nasal Oesophagoscopy (TNO) training event. Mr Karagama, who has special interests in laryngology and rhinology, joins our four other experts: consultant head and neck surgeon Mriganka De, senior speech and language therapist Kate Young, consultant ENT surgeon Declan Costello, and George Garas SpR ENT – Head and Neck surgery. The interactive course is set to take place on Friday 10 February 2017 at QE Hospital in Birmingham and will see the faculty deliver educational lectures on the TNO technology and its application, before delivering an afternoon of hands-on skills demonstrations for attendees. Places are still available for the course, which runs from 09:30am – 4:00pm and costs £150 for consultants or £100 for ENT SpRs and trainees. The event also counts towards six CPD credits. Earlier this month, the team from DP Medical headed to Medica – the world’s leading trade fair for the medical industry. In his latest blog, Owen Pemberton takes a look back at the event and discusses the range of innovative products on show. Held annually in Dusseldorf, Germany, the Medica trade fair is one of the most prominent dates in the health industry calendar. More than 5,000 exhibitors from over 70 countries travel to the event to showcase their latest innovations. exciting developments and groundbreaking work taking place across our industry at the moment. DP Medical Systems Ltd visited the event to support our valued suppliers, XION Medical and PROMOTAL – both of which were exhibiting at Medica 2016. 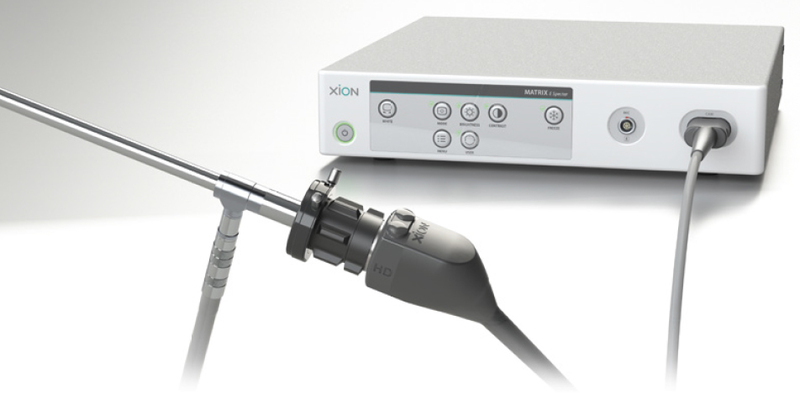 In Hall 10, XION provided attendees with demonstrations of its pioneering endoscopic products including the EndoSURGERY Trolley, which features an uninterruptible power supply, and the Matrix E Spectar - an endoscopic camera capable of producing clean and crisp HD images with natural colour reproduction and homogenous illumination. 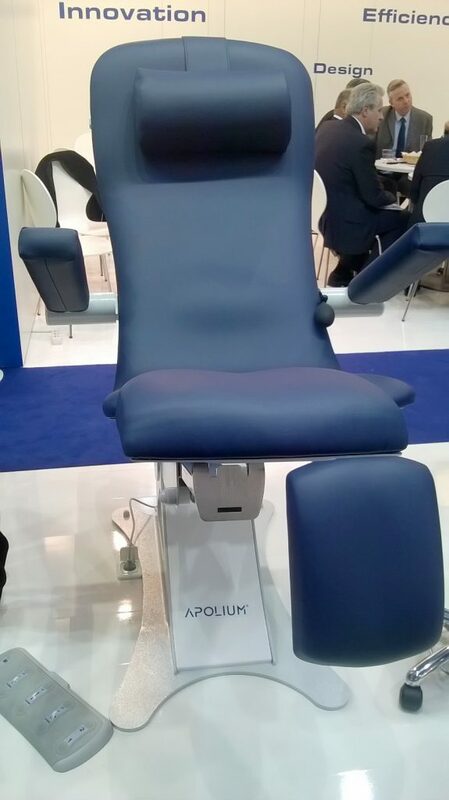 And, in Hall 14, PROMOTAL showcased the latest advances in its Tweegy transfer chair – renowned as the ‘easiest and simplest transfer chair ever designed’, as well as its eMotio+ examination chair which now has additional features including an adjustable head rest, convertible arm and leg rests and gynaecological tilt. Attending events such as Medica and supporting the fantastic work of our suppliers is vital to us here at DP Medical. Our customers know and value the products created by both XION Medical and PROMOTAL, and it was fantastic to see the great feedback both companies received from audiences at Medica 2016. We look forward to working closely with both organisations over the coming months and years to help bring more of their products to market, helping healthcare providers to improve by investing in innovation. For further information about Medica, visit http://www.medica-tradefair.com.